We got our first hint of comet weather last August, when the Rosetta probe’s VIRTIS instrument sniffed a square kilometer-sized patch of ice in 67P’s “neck” region. Turns out, that ice patch sublimates into a cloud of water vapor when the sun rises, growing again when the neck rotates into darkness. While this has the hallmarks of a simple water cycle, it’s a bit different from how the weather works on Earth. Rather than raining out onto the comet’s surface, 67P’s ephemeral cloud zips away into space when night falls. The team behind the discovery suspects that the ice is replenished from below, through fissures that grow during the day as the sun’s intense rays scorch the surface. 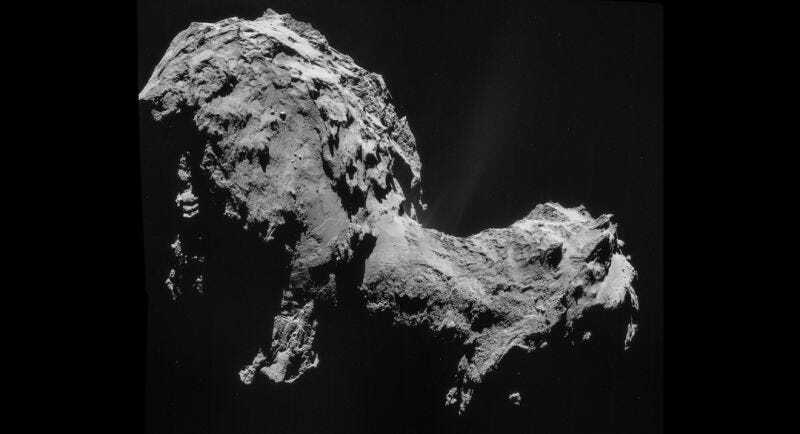 Over time, this process could eat through the comet’s water supply entirely. It’s just the latest in a string of fascinating cometary puzzles Rosetta researchers are now sinking their teeth into. From tunnels that continue to grow before our eyes to the rudimentary building blocks of life to dramatic jets that out-puff the solar wind, 67P is showing how little we really knew about about the life and times of the nomadic space rocks zipping about our cosmic backyard.